Every single person has a story to tell about how they lost data. Data loss is such a real problem for many people. You can imagine going to sleep at night with your phone under your pillow. When you wake up, all your phone contacts are gone and the messages also deleted, plus music and pictures too. The reason for this loss is that you forgot to lock your touch screen and as you tossed and turned over the night, you kept directing your phone to clear up your data. Imagine if this was to happen to your business’ data. Of course, you will not sleep on the servers that contain your databases but then there are ways that you can lose the data. In fact, there are lots of ways that you can lose this data from a database. There are settings that prevent you from getting access to your database. There are cyber terrorists who have perfected their trade and are ready to pounce upon you at any time. There are virus attacks that will affect your content. You would not want such an occurrence to happen on your WordPress database. This is why many people invest in finest database administrators and create many backups for their data. The best way to protect data from common losses is to make sure that you get in touch with a team of experts. Finding a good DBA is not a challenge anymore. These professionals seem to be everywhere. They provide fantastic services to businesses, website owners and other enterprises that need data IT solutions. Management of data is just one of the many tasks that they conduct. With the arrival of internet technology, many things changed including how databases are managed. Today, remote database administration is the trend. Many companies avoid hiring in-house database administrators nowadays but rather go for the remote DBA service providers. The remote DBAs do not need office space in your company but they will still keep track of your database’s activities and make sure that you get the best returns from the data you have stored in the database. Security is the primary goal of many DBAs. They strive to ensure that your database remains safe from external attacks. As aforementioned, there are so many cyber terrorists who are ready to hack into your databases and steal private information given the opportunity. A DBA is going to help keep these characters out of your database. They are also going to help a lot when you decide to rebuild your database to make it bigger. Generally, with them around, you will not have to worry about any issue related to databases. In as much as you can hire DBA to do all the data management work for you, there are some things that you should learn how to do. Setting up a backup for your database is something that you can do with such remarkable ease, including the manual backups. As technology continues to become more digital, backing up a database becomes more automatic. Manual backups are not such common activities nowadays. There are people who still do this. There are multiple plugins available for this work as well. They might allow you to toggle on and off the backing up of particular directories or files but with the manual approach you have complete control. It also ensures that your backup solution is completely functional. Every once in a while it is smart to conduct a manual backup activity and compare it to the last automated backup you did. This one is favored because it provides a comprehensive backup solution for WordPress sites. It gives you the opportunity to back up a variety of sources not just a hard drive. With BackupBuddy you can store away Amazon Web Services, Rackspace, Dropbox and even email content. The back up process is completed fast and effortlessly thanks to the push button solutions that it offers. All that you need to do is pick up where you would like to store your backup and how frequently you would want them to occur and you will be good to go. 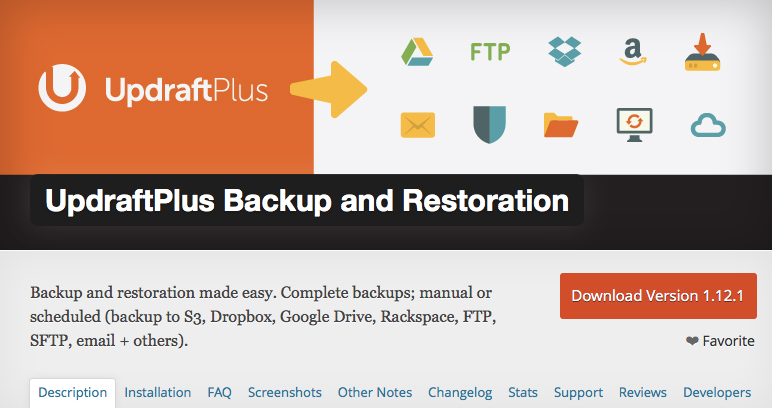 UpdraftPlus completely free unlike the before mentioned Backup Buddy. It is straightforward and user friendly. It will support backups to Amazon Web Services, FTP, Dropbox, Rackspace and email. It also works wonderfully with Google Drive plus a many other storage solutions. There is a premium version of UpdraftPlus and it comes with added features, such as automatic updates, reporting, no advertisements, site migrator, and so forth. BackUpWordPress is another plugin that is extremely popular. It allows you to backup your WordPress site automatically. This plugin includes scheduling so that you are able to create a different schedule for your files and your database. Setting it up is effortless and it is completely user-friendly. The only problem with this one is that if you would like to store your backups anywhere else other than your email or hard drive then you will have to purchase an extension. This plugin comes with an extension for individual cloud storage, which includes Dropbox and Google Drive. Backing up your content is important. Setting up a database backup is not exactly the simplest of tasks, but if you have a good database administrator, you will be able to save yourself a lot of effort. That time you can spend in creating the backups, securing the database and other security tasks can be saved by using backup plugins and hiring a remote database administrator. It is easy and it really does help the business to grow unaffected by technicalities.